So often we take for granted the need to carefully document an event we've researched in our never-ending quest for genealogical omniscience. 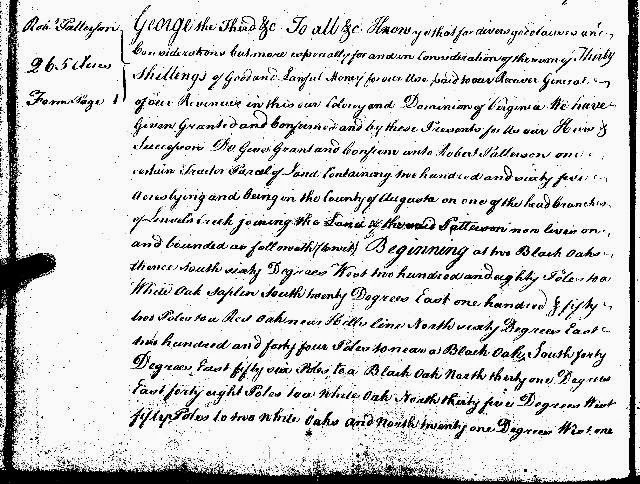 For example, my 6-greats-grandpa (Robert Patterson) obtained a Virginia Land Patent (grant) in 1764 for 265 acres on Linville Creek near Harrisonburg. Big deal. Get a copy of the 1764 patent and you're good to go. You see, there were at least three recorded events pertaining to this tract. In 1740 there was the Land Entry. Patterson recorded the tract as 230 acres in the Orange County VA Land Entry book. And then there's the survey which was done and recorded in the Augusta Co VA book of surveys. The survey was for 265 acres instead of 230. 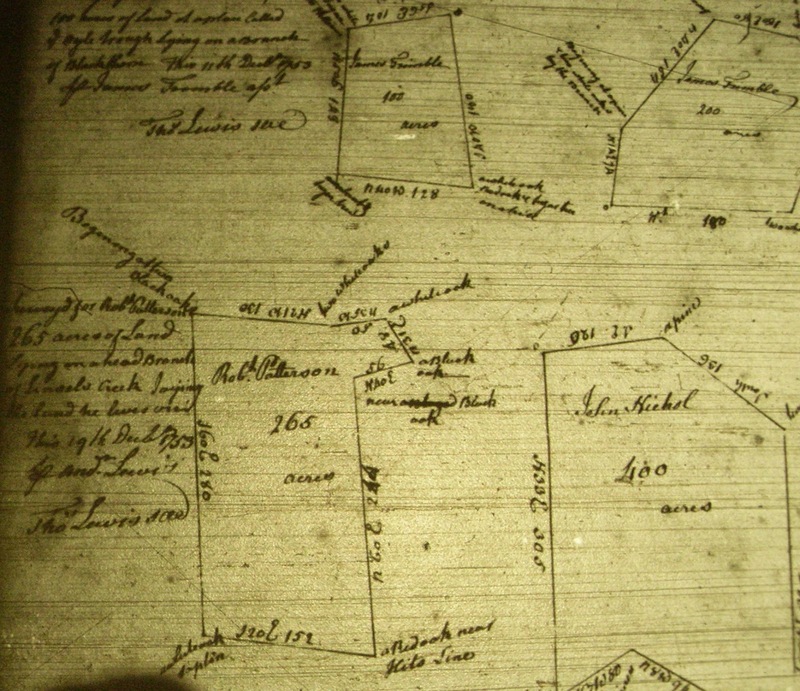 Then there was the Land Patent, issued and recorded in 1764, also for 265 acres. Here's the lesson. If I were doing my research and all I had found was the 1740 Orange Co Land Entry, I would think Patterson owned 230 acres on Linville Creek. The survey is not oriented to North, by the way. You need to rotate the tract 60 degrees clockwise (North 60 degrees East) to get an accurate rendering. The bottom right corner says "Red Oak near Hits Line". Joist Hite was a prominent land holder in the Shenandoah Valley. He received thousands of acres patented to him and some business partners. Many surveys would indicate a "joining to" Hite's line or Hite's corner, etc. Often, it was spelled "Hit" or "Hits". Problem is, all indications have always said this Patterson tract was near Abraham Hill's tract, such as "near Hill" or "near Hils Line". So this is misleading to some degree. Is it Hill or Hite? Another problem with the survey is that on two of the seven lines, there is an error in the direction recorded in the survey book. Without the 1764 patent, you wouldn't get the correction needed. Two of the directional descriptions in this survey says "W" instead of "E", or vice-versa. All of the "N" and "S" beginning directions are correct, it's the degrees direction that is off two times. In other words, "N60E244" would indicate North 60 degrees East 244 Poles. This means that from this point, face due north, then turn 60 degrees to the east or clockwise, then go 244 poles to the next point. Each "Pole" is 16.5 feet by the way. There are two pages here. On the first page, on the fifth line from the bottom of that page, in the middle of that line, you can clearly see "Hills Line". All seven directional descriptions for the lines are accurate here as well. Our lesson in genealogy with this example is that no one record by itself is sufficient to give us a full picture about Robert Patterson's involvment with this land and the scope of this land. The patent gives us the most accurate description of the land - its scope - but by itself, you'd think Patterson just acquired it in 1764. If you found the survey, you might then realize that he had it surveyed in 1753, so perhaps he was already living there by that time. In reality, he entered the land in the record books in 1740. In fact, he entered it twice, the first time in 1739, and then entered again in 1740. We also know that he sold his DE land in 1738, and that many of his relatives and neighbors from DE had moved to the Linville Creek area in 1737 and 1738. The point? You need to pull all associated records to get the big picture. You need all associated records to clear up any scribal errors by the county officials, of which there were many. It's a tough lesson to learn sometimes, but it's a lesson that comes with benefits. Keep that in mind.